You have seen me at the gym. I am the 200 pound, forty-something woman in street clothes, the one sneaking past the herd of weight-lifting machines so they won’t stampede. You have seen me in the pool—the doggy paddler who wears bifocals instead of goggles. While broad-shouldered young men cut through the water like sharks, I swim like a house cat. But I swim—almost every day. It is my favorite part of the day. Swimming is saving my life. Constant pain from rheumatoid arthritis and dark thoughts from chronic depression make me question the value of my life. For more than a decade, I fought to keep it together—working full time teaching middle school English, raising two sons, doing volunteer work for my church. But I knew, and my patient husband knew, that everything was gradually getting worse. My doctors probably knew too. My rheumatologist diagnosed me with fibromyalgia in 2015. His theory is that fibro develops as a comorbidity with RA when patients don’t sleep well and have a hard time consistently managing their pain. As a writer and English teacher, I was annoyed about being tagged with another unspellable label. As a budding disability advocate, I am still annoyed to have an invisible condition that even many doctors don’t believe in. As with RA, treatment is experimental and hit and miss. My rheumatologist tweaked and doubled my pain meds, while my GP tweaked and doubled my antidepressants. All the medication only worked a little. I was still hurting, stressed, and exhausted. The only time I felt better was when I was eating.The lunch I brought to school was the creamiest yogurt I could find, but Saturday was even better because that’s when I went shopping and bought ice cream. I often ate two pints per weekend and joked about committing suicide by ice cream. But it wasn’t really a joke. My genetics point to two options: dying fairly young from a heart attack or living with chronic pain well into my nineties. Some days the heart attack seems like the best option. When I started my second very hard year of teaching and nothing seemed to work, I decided to fix myself. I started the “Take Shape for Life” diet which is taking off about two pounds per week. (My health coach would love me if you message me for her information.) I looked forward to getting a gym membership and swimming once summer came. But losing weight didn’t make me feel better. My new drugs made me lose track of what I was doing. Teaching really didn’t work any more. I chose sick leave over job loss and started swimming in February. Water takes away my struggle with gravity. While I swim, I breathe hard and feel my muscles working, but the pain is gone. That small respite, four times a week, improves my outlook on life. So does the silence. I swim at a gym, so there is no kiddie pool, no water slide. Even when it’s crowded, everyone swims quietly. I can spend time alone with my thoughts while not being derailed by pain or interruptions. I admire the serious swimmers, athletes who probably competed in high school or college, their swimming is beautiful. But they are not the swim team I am aspiring towards. I want to join the little old ladies. I have met three so far that swim on a similar schedule to mine. My grandmother, who is now 96, swam regularly well into her eighties. You have seen me. I am the 200 pound woman who used to weigh 260, working hard to become little,working hard to become old. The first thought was a hand-knit swim suit, an idea I instantly found hilarious. I’ve seen crocheted bikinis, but nothing that could actually be used for swimming. There is also the issue of figuring out who it should fit—my size 0 mannequin, my size 18 self, friends or relatives in between who would never wear such a thing? 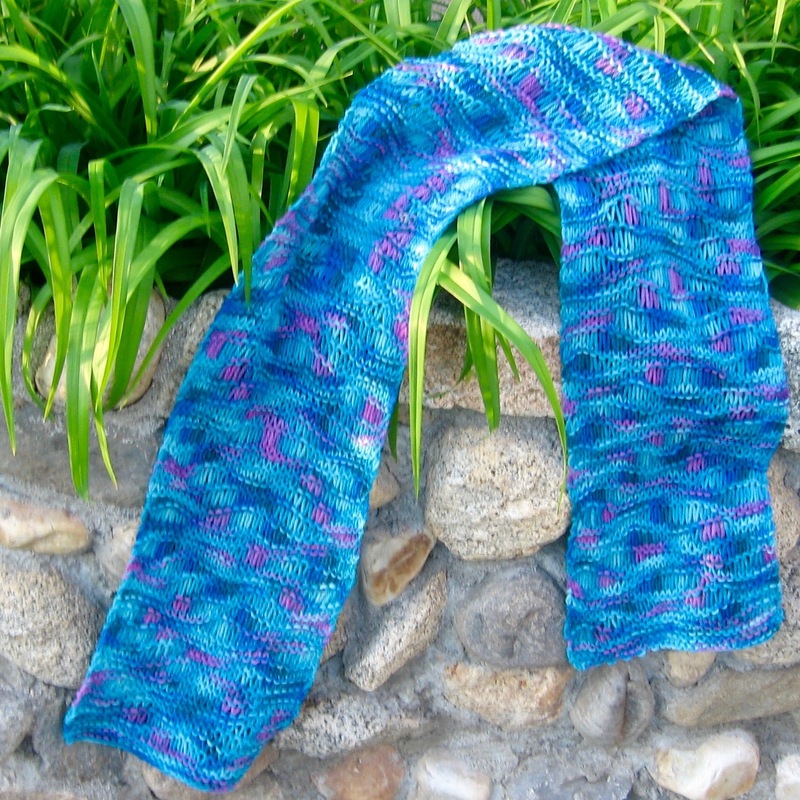 Luckily I remembered my swimming pool colored yarn and decided a pool-inspired scarf was quite good enough. I owned this yarn for years. It was a clearance find that never quite fit any of my project ideas. 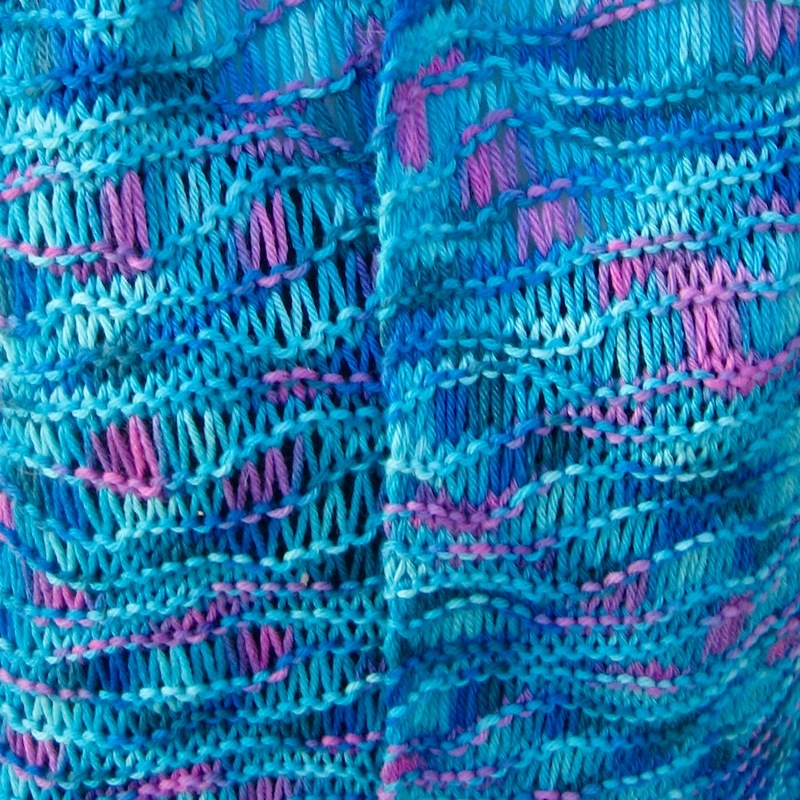 But the colors remind me of a swimming pool from my childhood. Grandma lived in Orderville and a motel owner across the street let her use the pool. I remember going to the pool at sunrise and shivering into the barely-heated water. Although I had a couple of neighborhood swim courses, it was really at that pool that I learned to swim. I jumped off the diving board for the first time and figured out treading water and Grandma’s two head-up swim strokes—the side stroke and doggy paddling that I do now. The wavy pattern on the scarf is inspired by the gentle waves of a summer swimming pool. But since the yarn is 100% wool, most people will want to wear it fall through spring. It is available for $30 at my shop. I wanted this to be a relaxing knit. Despite the lacy open-work, there is no actual lace knitting involved. 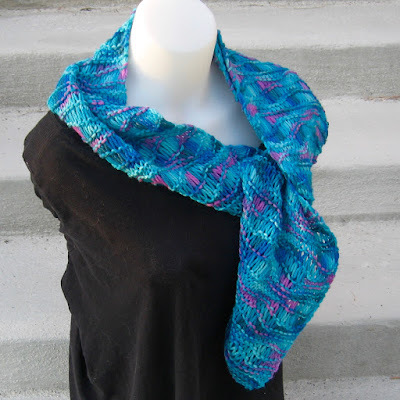 This is an easy-level pattern that can be worked with any type of yarn. You can purchase a copy for $5.